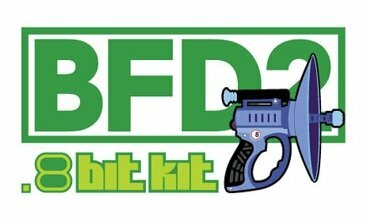 8 Bit Kit is an add-on pack for FXpansion's BFD2 and BFD Eco software drum systems, offering exciting new flavours for your productions. Recorded at The Sound Factory in Los Angeles, 8 Bit Kit is the brainchild of S. Husky Hoskulds, recording engineer for such diverse artists as Tom Waits, Fantômas, Solomon Burke, Joe Henry, Sheryl Crow, The Wallflowers and many more. This collection of drums, cymbals, hi-hats, percussion and electronics features dozens of unique, vintage, handmade and exotic kit pieces, all captured by a strange and wonderful array of microphones. 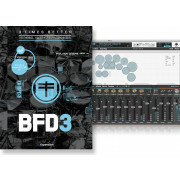 What makes 8 Bit Kit sonically unique is the way the drums were prepared, tuned and hit. The kicks are recorded using various unorthodox techniques including chains attached to the front head, detuned, or even hit with a paint roller. Some of the snares have been modified by Husky himself, fitted with calf-skin and Kevlar heads; hi-hats are aged, cracked, mis-matched or warped. An esoteric percussion palette includes African hand drums and Moroccan tambourines mic’ed from both above and below, as well as a range of claps, stomps, junk percussion and even a Fight Bell. Certain 8 Bit Kit sounds are also provided in processed, boosted versions; a few select pieces have been treated further to add grit and punch – more distortion, more compression, more texture, more 8 Bit! The microphones used are as unique as the drums themselves, including parabolic “Spy Mics”, Calrec Soundfield stereo mics, and mics with gramophone horns attached. 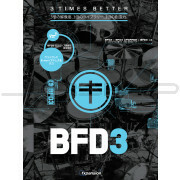 The room used at Sound Factory studios offers an intimate, tight sound that also integrates well with the bigger rooms found in the original BFD and BFD2 libraries.